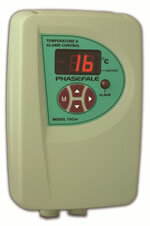 Temperature control with timing and safety controls specifically for use with bulk Milk Vats. VatPac is robust and durable to withstand the rigours of life on the farm. Precision temperature control of the Vat’s Milk temperature ensures Milk is kept in top condition and power consumption of the refrigeration plant is economical. An integral agitator output control operates cyclically and on demand to guarantee butterfat is thoroughly mixed throughout, particularly during transfers to tankers. A safety monitor circuit prevents excess pressures in the Vat which can lead to expensive plate damage in expansion systems by halting solenoid control.